Based out of Edmonton, Alberta, young producer Jordan Andrew aka Flavours has been incubating his musical trajectory from a young age. Having a strong music influence in his family, he went on to discover music production and turntablism in the realm of funk-influenced electronic music. He's now planted his passions in the labor market by attending school in Vancouver to learn the ropes of sound design in film and television. 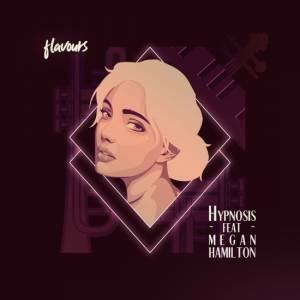 It's safe to say, we're sure to witness a constant evolution in Flavours with the latest installment in that evolution being the new single "Hypnosis" featuring vocalist and producer Megan Hamilton. In this track, we're given exclusive access to the dopest speakeasy in town. Together in this track, a selection of locally-grown, seasoned jazz musicians, Flavours brings a fresh blend of hip hop to a foundation of swing and jazz. The subtleties matter in "Hypnosis" from the catchy hook to the instrumentation to the touches of turntablism all together lending a diverse, yet ripe arrangement. Minneapolis-based producer Megan Hamilton's vocals gave the song its essence, which nearly caused Jordan to drive off the road from excitement when he first heard her version on his car stereo. "Hypnosis" is among the most involved projects to date for the young artist. With a composition together with professional jazz musicians to fellow electronic producers, it's apparent that the Flavours pallet for working with others is ever-growing. This is my most collaborative project to date. The shell of the song was formulated more that two years ago when I sent it to Chris Andrew (of the award winning Hutchinson Andrew Trio), to jam on top and give some new light to the tune...I figured the icing on the cake would be some brass, to which my Dad very quickly recommended the veteran musician Bob Tildesley to jam on top of it. He delivered multiple solos, hooks, choruses that made my job VERY easy. I polished the song up, gave it multiple new mixdowns and masters and shot the video with my talented pal Cory Johnn, in Edmonton's iconic jazz club, The Yardbird Suite. It seemed fitting to have a grande piano in the video, and Bob casually ripping his solos. The only missing piece of Megan, but perhaps that'll be for a future song! Stream "Hypnosis" featuring Megan Hamilton on all major platforms here.